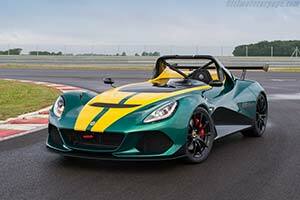 Heralding a new generation of Lotus high performance sports cars, today saw the unveiling of the company's quickest and most expensive series production car ever, the 3-Eleven, at the 2015 Goodwood Festival of Speed. Designed as an uncompromised manifestation of the Lotus spirit, the new car is focused on providing an undiluted driving experience, and underlines the company's ability to deliver legendary handling and blistering speed. Working on the concept of less is more, and keeping close to Lotus' track roots, the dramatic new vehicle features an all-new lightweight body, with an open cockpit design and a revised V6 supercharged engine developing 450 hp. Two variations of the Lotus 3-Eleven will be available: Road and Race; both delivering an impressive combination of high performance, agility and precision. Based on the Road version, the Race includes a more aggressive aero kit, a sequential gearbox and an FIA approved driver's seat with a six-point harness. With a dry weight of below 900 kg (Race version), the 3-Eleven offers an enviable power to weight ratio, in excess of 500 hp per tonne, and is capable of sprinting from 0-60 mph in less than 3.0 seconds before reaching a maximum speed of 174 mph (280 km/h) for the Race version and 180 mph (290 km/h) for the Road version. Speaking at Goodwood, Jean-Marc Gales, Chief Executive Officer for Group Lotus plc, stated, "We always say that to make a sports car better, you make it faster and lighter. The new Lotus 3-Eleven carries that philosophy to a new level, and is perfectly in keeping with our brand values." Jean-Marc Gales continued, "This new car is a giant slayer, capable of embarrassing far more expensive rivals. It condenses our engineering know-how into one, hard-core package, and is so focused that it won't suit everyone. This is a perfect demonstration of the faster and lighter concept, something which will be crucial to all Lotus cars in the future."